Chile Quake Update: We Returned With Aid, Thanks To You! Kinship Circle’s Sister Michael Marie and Bonnie Morrison returned to Chile on June 25…and bussed cross country to the coastal village of Tirua. Kinship Circle reunited with Socorro Animal Chile (SACH) veterinarians, who were conducting a spay/neuter and first aid clinic for quake and tsunami stricken animals. Bonnie and Sister presented a large monetary gift, along with six boxes of medical supplies. Sister, who is trained as a vet tech, then assisted with surgery, while Bonnie served as a recovery room nurse. SISTER WRITES: We worked with SACH all day in Quidico. Two people were stationed at each of four surgical tables, to attend to animals. We were happy to reunite with our colleagues: Chilean vets Rodrigo Flores, Camilo Salazar, Glenda Cabrera, Enrique, Luis Seguel aka Shiry. SACH leaders Cesar Sanchez (Assistant Coordinator) and Alejandra Cassino (National Coordinator) were also present to receive Kinship Circle’s gift and helping hands. We hope to raise funds for quake/tsunami animal victims all summer long. 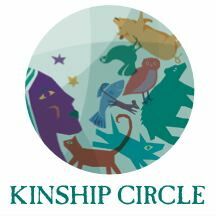 Kinship Circle has no major funding source. Your support is a lifeline! U.S. donors have largely overlooked this disaster. Kinship Circle has poured money into deployments, but had no major grants or sustained funding to support months of work in Chile. Socorro Animal Chile (SACH) — the amazing coalition of Chilean animal groups/veterinarians we work with — don’t have the veterinary supplies to go on. PLEASE WATCH AND POST THIS VIDEO! Earthquakes. Oil Spills. Floods. Too much to process. Our senses get dulled. But I am so upset about a phone call I received that I am writing to you personally. Traci Dawson, our Team 3 leader in Chile, reports that an evacuee camp in Talquahano wants to kill all its companion animals. People who lost everything in Chile’s 8.8 earthquake and tsunami can’t even feed themselves. They don’t want to watch their animals starve to death. 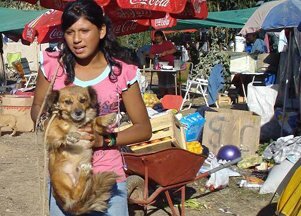 Kinship Circle and SACH (Animal Relief Chile) responded immediately with food and veterinary first aid. We met with the tent camp’s “Mayor.” The animals here are hungry, many injured, some sick. 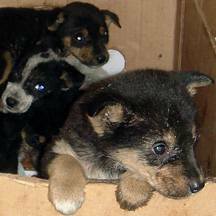 We rescue litters burrowed inside wreckage, almost daily. 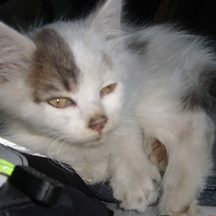 This kitten has a broken femur bone that went untreated since the earthquake. There are 30 tent camps along Chile’s ravaged coast. People and animals occupy row after row of tents. We fear a similar mentality will invade all the camps. Though we travel north and south of Concepcion, we routinely run out of sutures, latex gloves… One of our veterinarians in Chile now, Dr. Dan Meakin, even performed surgery on a dog in an open field. At times we can’t afford the van rental to ferry our team, vet supplies and food. 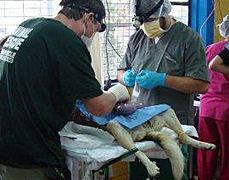 Kinship Circle’s Dan Meakin, DVM, and a Chilean vet perform surgery on a dog at a clinic in an empty building. 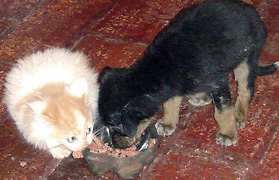 This rescued kitten and puppy are so happy to eat, they have no problem sharing the bowl! We promise the camp in Talquahano we will return. We won’t let despair propel them to shoot their own animals. But the situation distresses me deeply. It speaks volumes about Chile’s quake/tsunami victims…and how the world seems to have forgotten them. People assume they can recover on their own. They’re wrong, especially when it comes to animals. 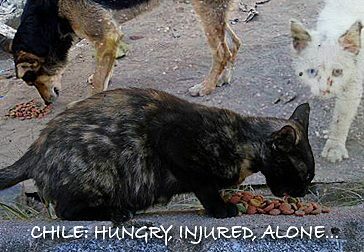 We need funding to treat animals and distribute food. – Chile has no animal shelters. No animal disaster plan. 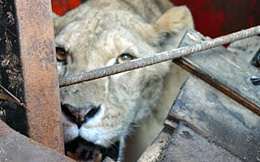 – Evacuees in tent camps need aid for their animals now. – We can’t send in our Team 4 without more funding. 2. TENNESSEE FLOOD: Kinship Circle has learned that DSHR Red Cross Volunteers have been activated for two weeks, to setup and run human shelters in the path of Tennessee floods. The animal situation is currently under evaluation. If called upon to deploy volunteers, we will notify Kinship Circle’s disaster aid volunteer network. Please help. We need funds to buy vet supplies in Chile. 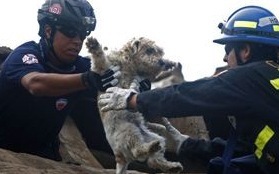 A puppy and cat are pulled from the wreckage of Chile’s quake and tsunami. Our teams are in Chile right now — working in the shadow of a possible cull of some 700,000 animals… HELP US KEEP OUR PROMISE to Chilean animal groups, government agencies…and mostly, the animal victims of a mass earthquake and tsunamis. 1) FIELD RESCUE + FIRST AID: Kinship Circle’s team works with Chilean veterinarians in the coastal towns of: Villa Futura, Santa Clara Talchuano, Calita Los Morros, Calita il Fiernillo… We saw 500 roaming animals in one area alone. Each day, we treat wounds, infection, parasites, insect infestation, worms, broken bones, etc. 2) VACCINATION & TAGGING: We hope to vaccinate and ID animals — to dissuade the government from a mass kill of animals due to human health concerns. 3) TEMPORARY CLINIC/SHELTER: Chilean vets and Kinship Circle want to create a one-year clinic/shelter. Our emergency shelter plan — including surgical, diagnostic/treatment supplies, animal care items, and a project manager — runs just over $700,000. We already visit the tent camps. to treat evacuee animals like the little girl’s dog above. 500 animals in one area alone. An oil-drenched kitten. 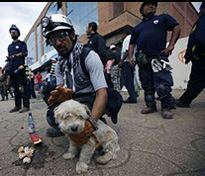 A dazed puppy in an intersection… At Chile’s ground zero, we see animals everywhere. Kinship Circle works alongside Chilean veterinarians to save them — but can’t get animals off the streets without your help. Worse, Chile’s government has discussed a cull of 700,000 animals in hard hit communities. As we travel the coast, Kinship Circle IC Traci Dawson likens it to Chile’s “Upper Ninth Ward,” in reference to a Katrina ravaged community in New Orleans. Pre-quake strays with mange, malnutrition, infection…blend with animals displaced by an 8.8 magnitude earthquake and tsunamis. Still, that puppy in the middle of the road? She is safe and will be adopted. The animals near the oil spill? They are fed and clean. • To send teams over several months, including airfare, van rental, field rescue gear, etc. • To position our project manager on site and maintain daily communications. • To (funds permitting) develop a temp clinic/shelter for injured, sick and homeless. ACTIVITIES: The turnout is staggering. There are virtually no neutered dogs… Vets examine animals, checking eyes, teeth, ears, glands, neck region, flea infestation, spines, organs, heart, etc. Skin disorders are prevalent, as are wounds and bites. ISSUES: The clinic runs out of pest spray, latex gloves and paper towels. Though Kinship donates latex gloves, there still aren’t enough. STATS: Today the clinic sees over 200 animals. OVERVIEW: An earthquake and tsunami crashed into this “fishing town” near ground zero. Torn nets and debris cover beaches and streets. Numerous dogs rove amid rubble. Homes are rimmed with waterlines about 5 feet high. Buildings have Katrina-like mold, mud, water damage and collapsed walls. ACTIVITIES: We spot a nursing dog. Fishermen lead us to the vicinity of her den. We search for her pups to evaluate their condition, but mom has tunneled so deep underground that we are unable to safely reach them. Some evacuated locals left animals behind. An extremely large stray population wander streets and deserted buildings. All seem friendly, if skittish. We don’t encounter any aggressives. 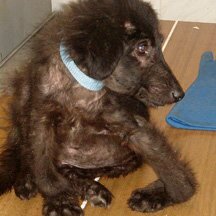 ISSUES: Mange, wounds, starvation, lack of water. Food is distributed in measured amounts because many sell food rather than feed animals. SIGHTING STATS: Roughly 100-150 dogs and unnumbered cats. ACTIVITIES: The team provides food and medical care to animals in the camp. Two cats with severe upper respiratory disease are treated on site. SIGHTING STATS: Approximately 200 dogs/cats. OVERVIEW: The earthquake caused an oil spill at a refinery along this town’s shore. Dogs and cats wade through black-water puddles. One cat is found atop a roof drenched in oil… Animals are decontaminated, but with no temp shelter, we can only release them. In a an area swarming with strays, we capture and treat a very skittish dog whose staked out his “spot” on a slab of cardboard. Down the road, we find an 8-week-old puppy dazed and ragged in the middle of an intersection. SACH takes the puppy to a clinic, where she’ll remain till healthy enough to adopt out. Kinship Circle team members contribute money toward the pup’s clinic fees, as SACH reveals they are now completely out of money. SIGHTING STATS: Over the course of the day, we see an estimated 500 dogs. The stray population has ballooned with animals displaced by this disaster. Kinship Circle’s team is en route to Chile. 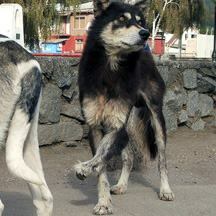 Animals have no borders, so when Chileans asked Kinship Circle to send teams to help displaced animals, we got to work. We are now in Chile for rescue, first aid and the eventual construction of a temp tent clinic/shelter to house homeless animals, treat injuries, vaccinate, and spay/neuter. A stretch of coastal towns, about 500-600 miles from Santiago, Chile are ruined from an 8.8 earthquake, aftershocks, and two tsunamis. Still, cries of animals are heard from the rubble. Many are sick from drinking saltwater… It will take 4 to 5 days for a SACH/Kinship Circle convoy to log animal numbers, leave food/water and treat any injured or sick animals. I wonder how we will find the money to finance all that needs to be done for thousands… Will people care enough about animals in Chile to contribute? Anyone who looks into their eyes would see the same sadness and confusion that I see. That look, a mix of hunger and hopelessness, was Katrina’s hallmark. 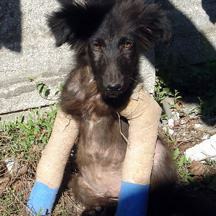 For some rescuers, it is a look that can never be erased. Chile’s Animals – Worse Than We Thought. Help Us Be There. Animals with broken bones. Eyes cloudy with saltwater. A kitten cut. Puppies under rubble. There are thousands more, each one a bark and purr unheard… THIS IS CHILE, post-quake. I just got off the phone with Kinship Circle’s Chile contact. She described the forgotten victims of Chile’s 8.8-magnitude earthquake on 2/27/10 — followed by 20+ aftershocks, some as high as 7.2 and 6.9, and two tsunamis. Socorro Animal Chile, SACH (Animal Relief Chile) is a coalition of Chilean animal protection groups united for the relief of an estimated 700,000 (or more) animals scattered across Dichato, Constitucion and Pichilemu, Chile. SACH sends three veterinarian-led teams into the field daily. They’ve formally requested assistance from Kinship Circle’s disaster response team. 1. Erect a temporary tent shelter/clinic to care for animals abandoned in the earthquake. 2. 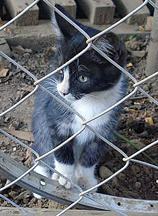 Carry out a spay/neuter campaign. 3. Focus on transport and adoption campaigns, particularly in the U.S.
WE NEED TO RAISE $500,000. I know you have DONATION FATIGUE! We wouldn’t ask, with Haiti animal aid still underway, if it weren’t critical. I ask for you to reach deep, to help with funding needs outlined below. 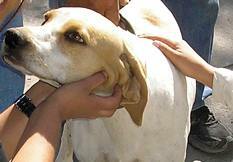 We can’t keep our promise to Chile’s animals without funding, as most of our resources went to Haiti work. — Basic veterinary clinic equipment, including vaccines, medicines, etc. — Sustenance (food, water) for volunteers + some equipment, such as catchpoles, etc. The earthquake and following tsunami that Chile suffered on the early morning of the 27th of February devastated several small towns close to the coast. Thousands of animals are silent victims of this catastrophe. Hundreds of dogs live with their owners in shelters and thousands roam the ruins of towns and cities. 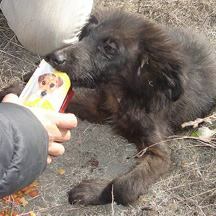 The dogs’ guardians have lost everything and do not have the resources to feed their animals. Some opted to abandon them. Chilean animal welfare groups and veterinarians decided to work together to help animals and created Socorro Animal Chile (Animal Relief Chile). Socorro Animal Chile (Animal Relief Chile) formally requests assistance from Kinship Circle for our animal aid operation in Dichato, Constitucion and Pichilemu, Chile. We need trained animal disaster responders and rescue and veterinary specialists. On behalf of the animal organizations in SACH/Animal Relief Chile, we ask that Kinship Circle deploy its team to Chile to work within our animal disaster plan, in response to Chile’s earthquake. We also ask Kinship Circle to temporarily receive donations in the United States on behalf of Socorro Animal Chile. We urgently need funding to sustain our work for animals. Difficult bureaucratic steps necessary to opening a Paypal account ourselves, in Chile, have prompted SACH to request financial aid from other countries, especially the United States. That is the reason we ask Kinship Circle to accept funds on our behalf. – (AP) 3/4/10: The magnitude-8.8 quake and tsunami that followed ravaged a 700-kilometer (435-mile) stretch of Chile’s Pacific coast and killed at least 802 people. People missing, unknown. People affected, 2 million. 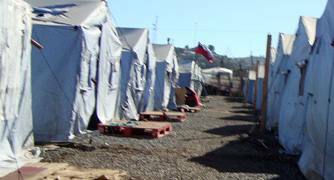 – Chile has asked other countries and the UN for temporary bridges, field hospitals, satellite phones, electric generators, water purification systems, field kitchens and dialysis centers. – (guardian.co.uk) 2/27/10: The 22-mile deep earthquake caused buildings to collapse, fires to erupt, and unleashed a tsunami across the Pacific. It devastated the city of Concepcion, 70 miles from the epicentre. – “This quake was around 500 times the magnitude of the one that devastated Haiti in Jan.,” but it was deeper and Chile’s buildings are sturdier, so there were less casualties. – Powerful aftershocks: There were 29 of magnitude 5 or greater, and one reaching 6.9, the US Geological Survey reported. CEFU executive director Alejandra Cassino estimates more than 700,000 companion animals may be affected by the 8.8-magnitude earthquake that hit Chile’s central region on 2/27/10. 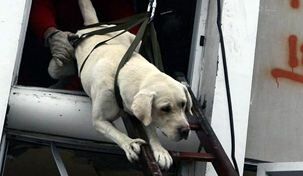 Coalition for the Ethical Control of Urban Animals (CEFU) has called upon other Chilean animal organizations to unite for these victims. Under the banner ANIMAL RELIEF CHILE, the coalition provides a national support network to cover veterinary care, resource management, communications, volunteers, etc. 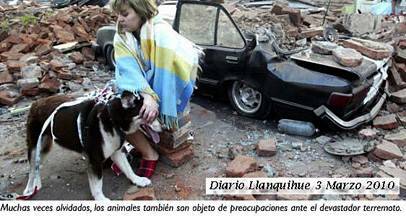 Animal Relief Chile — also called Socorro Animal Chile (SACH) — asks the Chilean animal community and the rest of the world to join this campaign to help the animal victims of the earthquake, and their caretakers. IFAW Emergency Team on Alert — A magnitude 8.8 earthquake struck near the city of Concepcion, Chile… More than 2 million people are displaced, wounded or otherwise affected… Shortly after the earthquake, IFAW reached out to our friends at animal protection groups in Chile to assess the needs of animal victims. We are standing ready to provide emergency grants or whatever else is appropriate during these difficult times. Please Give To Kinship Circle’s Disaster Aid Fund…So We Are Always Ready! Hurricane Katrina, Rita, Missouri Flood, Iowa Floods, Gustav, Ike, Kentucky Flood, California Wildfires, Haiti… You helped us be there for animals. This entry was posted on Saturday, March 6th, 2010 at 11:28 am. You can follow any responses to this entry through the RSS 2.0 feed. You can leave a response, or trackback from your own site. Thank you for posting this! I’m always looking for great organizations to donate to whenever a disaster like this happens. Great post.